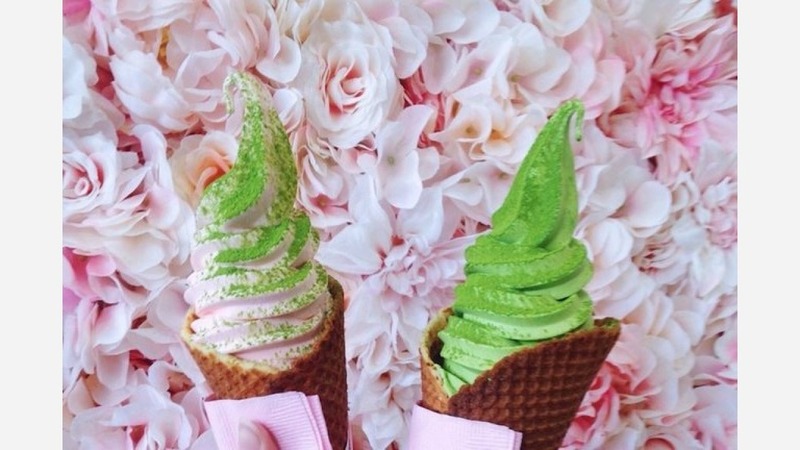 The Instagram-worthyMatcha-cha is the newest spot to score matcha-flavored ice cream and frozen yogurt desserts. Located at 11301 W. Olympic Blvd., Ste. 122, the sweet arrival is a welcome addition to Sawtelle. The shop's fresh color scheme of pastel pinks and greens extends to the treats, which are close-up ready against the backdrop walls of pink flowers and green banana leaves. Flavors consist of matcha, deep matcha, strawberry or twist, with the option of a homemade waffle bowl or cone. Top off your creation with mochi balls, adzuki beans and matcha powder. Unsweetened teas, coffee, smoothies and floats are also available. Matcha-cha has gotten good reviews thus far, with a four-star rating out of 37 reviews on Yelp. Natalie D., who was among the first Yelpers to review the new spot on April 23, said, "Tucked away in a corner is Matcha-cha, where they serve specialty soft-serve ice cream and drinks. I'm not usually too crazy on matcha but I really enjoyed their strawberry and matcha swirl soft serve. The flavors were all very subtle and refreshing." And Sandy N. added, "Reminded me of the matcha soft cream we had in Kyoto. The matcha is the real deal, and I love the homemade waffle bowl. The matcha drizzle was nice and strong-tasting. I'll be coming back!" Intrigued? Stop in to try it for yourself. Matcha-cha is open from 11:30 a.m.-11 p.m. on Monday, Tuesday, Wednesday, Thursday and Sunday and 11:30 a.m.-11:30 p.m. on Friday and Saturday.